You guys know that Super Bowl 53 is happening tonight from inside Mercedes-Benz Stadium in Atlanta, Georgia. The heralded New England Patriots are representing the AFC (American Football Conference) and looking to win a sixth Super Bowl when they clash against NFC champion Los Angeles Rams, who haven’t won since the 1999 season. Former UFC champion Conor Mcgregor who’s living his life fullest regardless of all the controversies surround him. 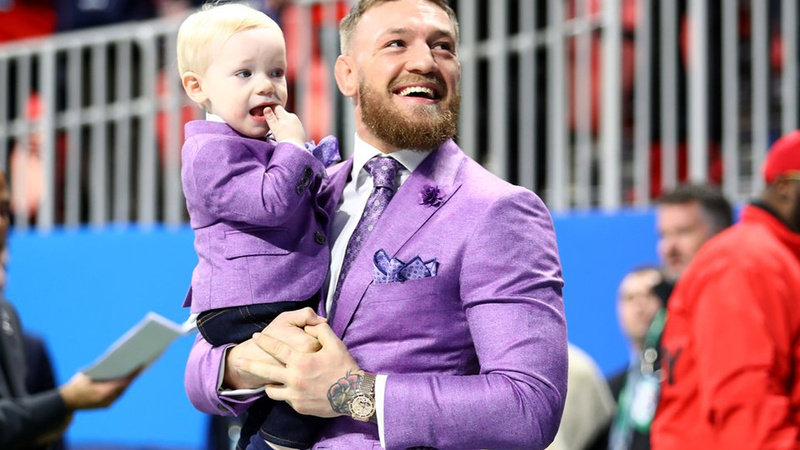 Among the A-list celebrities in attendance Irishman and his son Conor Jr. having a gala time at the field of Super Bowl 53. No doubt UFC cash cow is a supporter of the New England Patriots. UFC head honcho Dana White is also a big supporter of Patriots and will definitely be cheering for New England. You can also see below a Conor Mcgregor’s son giving Patriots owner Robert Kraft handshake. Mcgregor also gets to meet with comedian and actor Kevin Hart. That’s not the first time ‘Notorious’ present on the field, as back in October he was an attendee at Dallas Cowboys game.